Transtech staff has over 20 years of experience in civil engineering projects in various capacities that provide Transtech with a solid understanding of the technical aspects and requirements necessary to complete both the planning and technical design of development projects on time within budget. In addition, we provide City Engineering personnel under a staff support contract with a number of municipal clients. Transtech has a proven track record in providing high quality engineering services which result in minimal problems during implementation of projects. This requires extensive hands-on knowledge, experience, and management skills of the people involved in managing and inspecting the project. Our extensive local experience enables our staff to perform the necessary technical research, direct out staff and other project consultants in an effective way that will result in a timely completion of the entire project process. 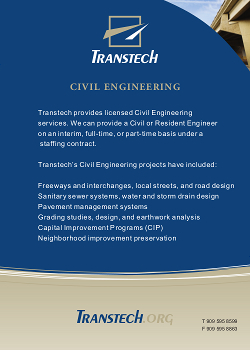 Transtech has participated on numerous multi-disciplinary teams dealing with the planning and development of civil and traffic engineering, urban and rural development, and public works projects, including Public Works and Infrastructure Improvements; Institutional Buildings; Commercial and Retail Buildings; Transportation and Parking Facilities; Sports and Recreational Facilities; Residential Development. In dealing with publically funded projects, Transtech has extensive experience in Caltrans Document Control, Caltrans Construction Guidelines, and Labor Compliance.